Prompt, Professional Homeowners’ Association Roof Cleaning and Commercial Exterior Pressure Washing Services. 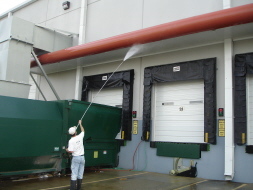 Do you have a large commercial building that needs to be cleaned? Or, maybe you are in a Homeowners’ Association or Apartment Complex that needs a Safe, Non Pressure Roof Cleaning. 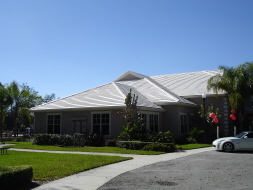 Peerless Pressure Washing and Roof Cleaning of Tampa consistently delivers professional, prompt results. Take a look at several roof cleaning and pressure washing projects that have recently been completed. The first picture displays a community of 40 barrel tile roofs being cleaned with our no-pressure roof cleaning system. Can you spot the few remaining dirty tile roofs to be cleaned? 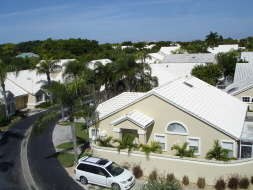 The second picture is of a white tile roof we cleaned in Brandon, Florida. This is a very large clubhouse for an apartment complex. Our non pressure roof cleaning system delivers prompt, professional results and customer satisfaction is guaranteed. Finally, we have an exterior pressure wash of a 230,000 square foot building for a well known pharmaceutical distributor in Central Florida. This building was cleaned from top to bottom, which included the windows, awnings, two shipping and receiving docks and parking areas.We also did some high pressure cleaning of the shipping and receiving concrete parking lot areas. This is a high traffic area where tractor trailer trucks are loaded and unloaded twenty four hours a day. Peerless Pressure Washing, Inc. was able to accommodate the trucking schedules while using professional equipment and proper soaps and degreasers, which, in turn, allowed us to complete the entire project within three days. At Peerless Pressure Washing and Roof Cleaning of Tampa Bay Florida we understand what it takes to serve our customers with the best roof cleaning and pressure washing services available. Whether you have a pool deck area for your Homeowners’ Association that needs weekly polishing or several hundred units that need a little TLC, we can deliver professional results on time. Call Peerless Pressure Washing and Roof Cleaning of Tampa Florida today for a free estimate. 813 230 5915. Painting contractors in Tampa – Licensed and Bonded PA2902. This picture displays a large dentist office that we painted the interior and exterior of. This painting project took us about a week to finish. The exterior had many areas that required scraping and stucco repair. There were large louvers that we had to restore before painting.